When I got my allotment 5 years ago I jokingly said I wanted to “pimp my shed” and have a min cocktail bar in it – nothing fancy just a shelf with a shaker and a few glasses. The nearest I’ve got is taking the freshly picked strawberries home, mixing a cocktail and sitting in the garden supping. It’s like bringing a bit of Havana home from the allotment! These words were reproduced in the Guardian’s readers recipe swap feature. I only found out a week or so after the publication; what I failed to do was add my blog as a link……. Let’s rewind a little. A busy schedule of work including filming in the Netherlands add to that the busiest time of year on the allotment for planting out – think of all the cucumbers, courgettes, squash, beans, tomatoes (you name it, its been planted!) all of which sees me in rush-rush mode, rushing from one job to the next, not thinking things through clearly and not paying attention to the details! So as I flail and fail about doing the rush-rush thing, slowly but surely the strawberries grow and ripen…… so its time to unwind a little, catch up on my blog reading intermingled with a splash of world cup footie and some lazing around in the garden. 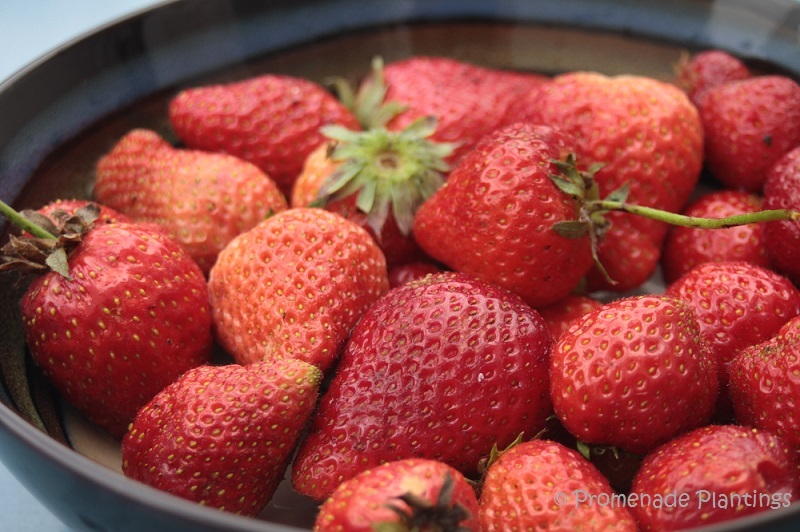 Reading other recipes like my friend Inger’s of Art of Natural Living I realise my recipe is sugar free – except that of course strawberries come naturally loaded with fructose and are sweet as sweet can be. So if unlike me and you have a sweet tooth, feel free to add a touch of sugar. But whatever you do I hope you get to enjoy the sweet scent of summer with strawberries, a kick of rum and a twist of lime. Place all the ingredients in a food processor and blast for a few seconds (warning: it will be noisy as the ice gets bashed!). Process until smooth, then pour into glasses, settle down and sip. Ah, I’m right now going to fill ice cube trays, so that I’m ready when the strawberries are…thank you, Claire! This is fantastic! Thanks for dreaming it up and sorry you couldn’t be here to share it! I have to buy my strawberries and they HAVE been lovely so I made a strawberry sponge flan with the last container a couple of weekends ago. I’ll have to pick up another for strawberry daiquiris even if my machine is not strong enough to turn ice into slush so I use frozen strawberries as the base. Congratulations on getting your recipe in the paper! I don’t think I’ve ever had a daiquiri before… now could be a good time to change that – the strawberries are just about ready. Love the daiquiri, adore the glasses and wow….The Guardian and uber glam work schedule….congrats! A quick dash into the kitchen to check I still have some rum left…. yes, this will be on the menu this week Claire! Thursday is a bank holiday here, so I just need to track down a lime or two before then. Thanks for sharing your recipe! You’d be welcome to share the strawberries Kathryn ! 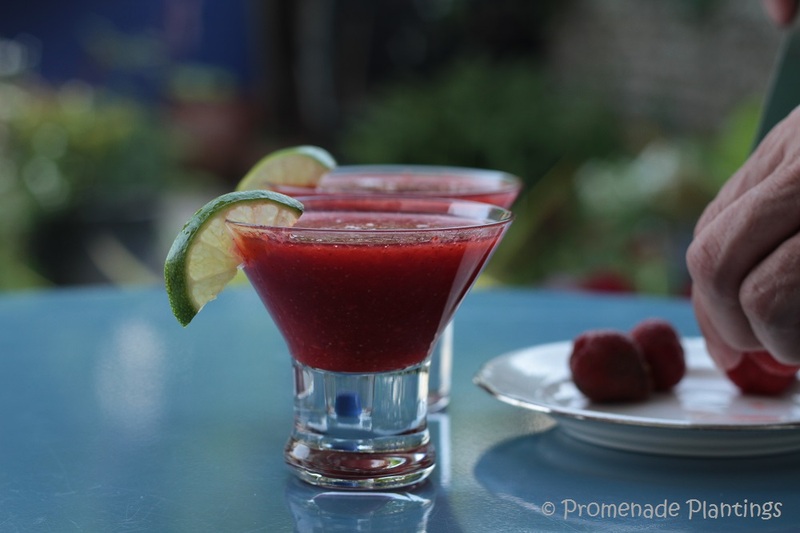 I’m thinking strawberry daiquiris an dsitting on your porch……. Yum! And no added sugar. Yum! Such a gorgeous color, Claire. And imagine making it with fresh berries you have grown — how special. Hi Sharyn, it was special, the more I garden the more I realise how good home grown fruit are – they take less care and attention than veggies, but most of all they taste amazing. Sounds really wonderful to me as is! I have recently planted more strawberries in our garden and I hope to at some point be able to have my own little “bit of Havana” in my own backyard. What a shame that you forgot to add your blog byline to your published article! Next time you must remember that. 🙂 Hope the allotment is continuing to give you a bountiful harvest, Claire. It just sounds wonderful! It’s strawberry season in the north of Australia and I’m so eager to try your daiquiri! Boy those sure look good. We just happened to have our own glut of strawberries, too. Hmmmmm….I’ll report back. A good point about the sugar in the rum Tandy. I tend to neglect my strawberries, they’d do much better if I looked after them with straw as a mulch and compost at the right time of year, but somehow I alwyas manage to forget those jobs! So I can only applaud Mother Nature! We had some tonight! Thanks so much for the great recipe. strawberry season has come and gone here in France but I am saving this recipe for next year, absolutely. Ooooh la la. I just place a yard chair in my garden just so I can sit in it, sip a glass of wine and read in the evenings amongst my plants…my own little allotment place sort of like yours. This cocktail is just perfect for warm summer nights. Beautiful color. Simple and lovely! Just my kind of drink! There have been a few breaks for bar time Shimon, especially now the World Cup is on we tend to go and watch a few of the matches in our local pub. Needless to say I prefer watching other teams than my own – somehow it’s less painful! Hi there my friend, sweet and delicious as you say! Now that looks delicious and refreshing! Love the color. This sounds and looks delicious and my strawberries are just starting to come in! Perfect timing. May I join you? Strawberry daiquiris are my favorite. Oh course you can join me! Pull up a chair, sit a while and chat and sip. Wouldn’t that be grand! See, perfect recipe for me – no sugar. Now if we could switch winter off so I could enjoy one of these in the garden that would be perfect. have a wonderful weekend Claire. I just flicked the winter switch to off for you Mandy, did it work?! and wishing you a greta weekend too! Your drink looks fabulous but I’m loving the term “pimp my shed” even better! Thanks Claire. another one! One day I’ll get round to it, I’ve also always fancied a disco glitter ball for the greenhouse…… just sayin! Your daiquiri looks so refreshing! And I’m still laughing at “pimp my shed” :D! Thanks Tessa, wouldn’t it be a fun thing to do! I have a horrible feeling I forgot to congratulate you on the Guardian piece (someone else with too much going on) So congrats matey, well done you! Mousse au chocolat and the secret trick …..